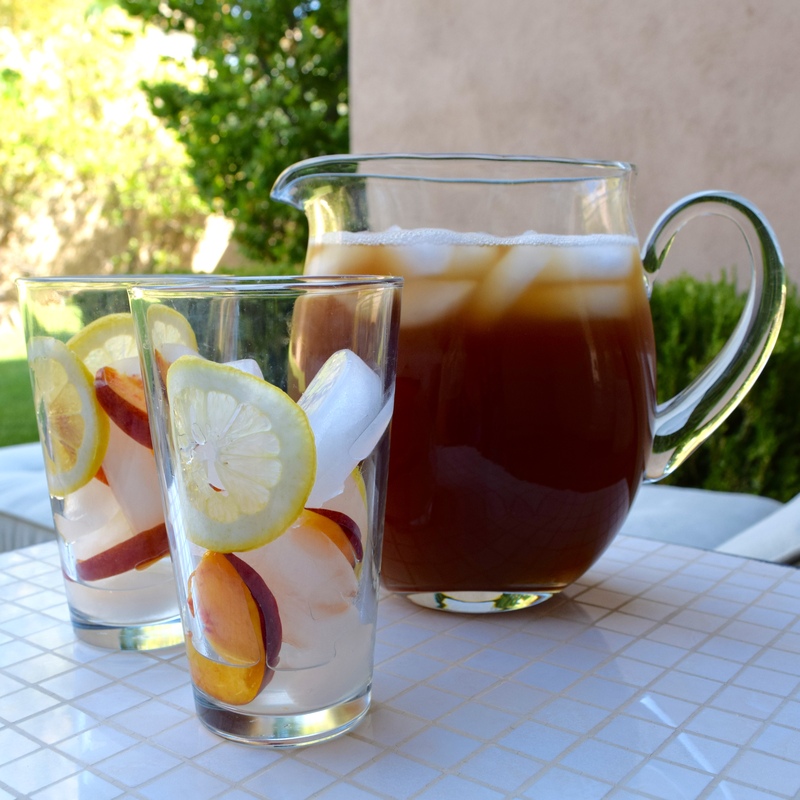 With the start of summer, it is not difficult to find delicious iced tea or lemonade recipes. The problem is they are usually full of sugar and with iced tea, lots of caffeine. For the moment, my husband must avoid caffeine and we want to avoid sugary drinks, which are bad for our health and teeth. As a dental hygienist, I am very concerned about the acid content of drinks. The best drink, of course, is water, but it can be boring at times! We both enjoy water infused with fruit, but after a while that even gets monotonous. There is herbal tea, but….. So what can one drink occasionally as a treat, without too much sugar, acid or caffeine? 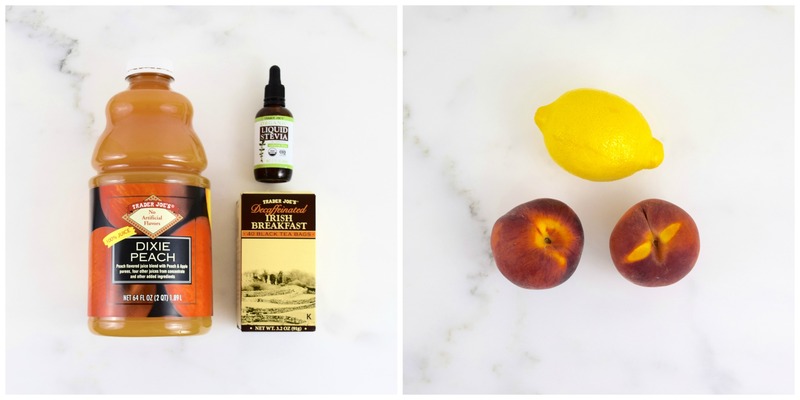 At Trader Joe’s I found a decaffeinated black tea, which has under gone “a very gentle process with natural water and effervescence.” I also found a peach juice sweetened with other fruit juices, instead of high fructose corn syrup. So I decided to put the two together to make a “healthier” peach tea sweetened with organic Stevia. 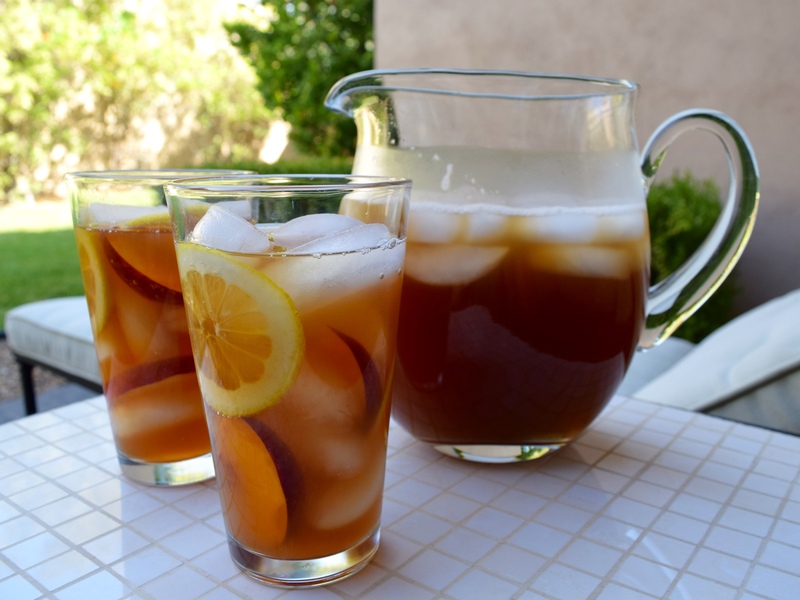 Using 2 cups (16 ounces) of Dixie Peach Juice and 40 ounces of the black tea, the total calorie count came to 260 calories for 56 ounces of my iced peach tea! Using a medium pot, bring water to a boil and turn the heat off. Add tea bags and steep for 3 minutes. Cool tea and refrigerate in a pitcher until cold. Add peach juice and Stevia and stir thoroughly. Add ice cubes. Add ice cubes and fruit slices into tall glasses. Pour tea into glasses and serve.